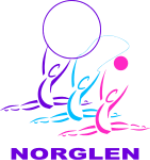 Welcome to the website of the NorGlen Rhythmic Gymnastics Club. We have been providing recreational rhythmic gymnastic classes to girls and boys aged three and up, and ladies in Lakeview and the surrounding southwest areas of Calgary, AB. For more information about classes, upcoming events, and registration, please follow the links above. Don't forget to follow us on social media to hear the latest news on Facebook, Twitter, and Instagram!